Canada’s second-largest bank is rolling out a new branch design, dubbed “Bravo”, starting with a prototype location in Toronto. 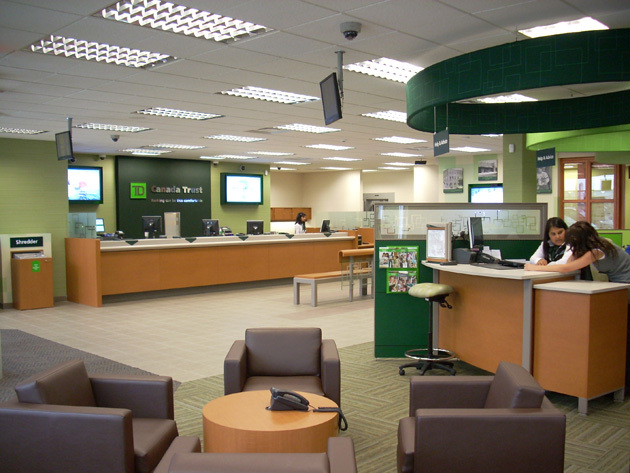 As with several other banks, TD is borrowing heavily from boutique and retail interiors to create an atmosphere that “resembles a cross between Starbucks and Ikea with plenty of high-tech banking gizmos.” The purpose is to make the bank a destination – a place that customers enjoy visiting and spending time at. “Bravo” branches, much like WaMu’s defunct “Occasio” locations, feature an open layout, a kids play area, and free coffee. TD’s branches will also have community rooms to accommodate families and small businesses, coin counting machines, digital displays, web kiosks, an online/printable brochure library, and video-conferencing with banking experts. This article states that TD’s marketing efforts could “revolutionize the way consumers bank”, which I think might be a bit of an overstatement. TD is certainly not the first bank to try this. In addition to WaMu and Umpqua Bank, many smaller financial institutions have changed their branches to resemble retail locations. While it may make the banking experience more pleasant and encourage customers to stop in more often (both of which are very important), it certainly hasn’t revolutionized the way they handle their finances. The most important point made by the article is noting the shift back from the late 1990s, when banks were heavily promoting online banking and other lower-cost platforms – “Between 1998 and 2006, the top eight Canadian banks have on average reduced the number of retail branches they operate by 23 per cent, despite a 37 per cent increase in deposits.” Now, banks are acknowledging that in-person relationship building can really help cross-sell financial products and increase overall revenue. You buy from someone you trust, and face-to-face discussions with a financial adviser in a welcoming setting help establish trust. This realization is causing banks to once again invest in branch design, increased amenities, more convenient opening hours, and other consumer-centric changes. Large Canadian banks are following TD’s lead. Royal Bank of Canada and Canadian Imperial Bank of Commerce are both markedly accelerating their branch strategy for this year and next year. Pingback: Andera-Is American Banking Falling Behind?